we join the grand parade. Well, I just started writing this entry and my computer decided to update itself and shut itself down. NIIIIIIIIIIIIIICE. 2. Prepare for Fall semester. I always look forward to Fall because these are classes I love and this will be the 4th time I have taught the main two. Social problems I teach every semester so I am prepared for that already, though there are a few changes I will make to improve it this time. Social Theory– my FAVORITE, and students are usually all sociology majors who need to write a 10-page paper. Stratification we have fun with. 3. Think thru Criminology and Criminal Justice, one I taught last semester and One I will teach next Spring. For all my classes, I plan to get them down to the day in planning, with lecture, film, guest speakers, assignments, tests and class activities. 4. Put together my booklet of 15 Children’s class lessons on Virtues. Organize my children’s class materials, which are vast and totally disheveled right now in various containers and boxes. 15 lessons = 1 weekly lesson for a semester. They are virtues lessons with a base of spirituality adaptable to children of any faith background, incuding my own, the Baha’i Faith, which has a universal viewpoint. 5. Do more work on the mystery man, James Agnew, my great grandfather, more work on Family history, including some more on the Black’s, my husband’s family. Maybe copy pictures I have for siblings. 6. Find a few more gravesites for those looking for their family history gravesites, from findagrave.com. Family vacation 1 week in July. Meanwhile, my husband just lost his job. He earned employee of the month 3X in the past 6 mos., but he is laid off. Some new man in charge decided to make a name for himself by getting rid of all remote recruiters, even tho’ my husband has been doing this remotely for the past year. THAAAAAAAAAAAAAAAAAAAAAAAAAAAAAAAANKS!! Thanks a bunch. If we have to live on my salary, we are screwed. I really don’t want to move again. I could get a better paying job in my field, but for now, we’re cutting expenses as much as possible and seeing how it goes. He is 59 and unemployed. Besides that, I am having some other serious problems I won’t mention here. All I know is, wihtout prayer and trust in God, I’d be a goner. WITH those things, we are always winners. There is nothing that can harm me if I have my Lord’s love and guidance. This is all I can count on right now. This is an Indiana week. There is snow on the ground the entire time we’re here. Haven’t seen any new snow, it just comes & stays, never melts. Have spent the last 2 nights at my daughter’s, sleeping in Caspian’s bed. He sleeps on the couch. For him it’s a big treat. Was sick Tues. all day, feeling better today. Have not hardly been out of this house for 2 days. We are getting ready to leave for Al’s parents again. Nothing much happening, just sitting around at relatives. World going by. Sat. we leave for home. Our daughter is enjoying a fast, new computer, courtesy of us and 1 of our sons. She is working as a fork lift truck driver, gets to work by 6:30am daily. Have done more work on fam. history while here, it is mind boggling at this point, expanding everywhere. No end to it, and no siblings or parents of James Agnew yet. Next project is to try to find living relatives my age who may know something– anything– which will be a link to any of his siblings. Those siblings will link me to which family line he is from that I see on old census records. It is quite the puzzle. Have lost faith in political systems of the world. We rec’d a new 16-page document from the Universal House of Justice this week, which is amazingly significant in itself. Why now? Why at the end of 2010? Who knows. Haven’t walked one mile all week. We leave for Indiana early in the morning. I don’t really feel like we are leaving…. it was in the 60s here in SC today, don’t really want to leave. Our house is not cleaned, clothes still need packed, Al is hibernating upstairs as usual and we haven’t really talked much. Leaving until after New Yr’s! Thank you for that! I appreciate it. Especially 3 day ones like this one. Leah, Jean, Zakiah and Naylah all weekend. We had great fun. Zakiah was a true delight. Naylah was so sweet and fun. We all had a good time and didn’t spend much money at all. We cooked at home, never went out to a restaurant, and didn’t even have a grill. Dishes were being washed continually. Leah & Jean got to go out together Sat. night & I watched Naylah. She took the warmed bottle just fine! Other times over the weekend it wasn’t so easy. She is cooing and smiling. We went swimming in the pool, where the water has now turned cold. But it was still sparkling clean and great fun. Hardly anyone was in it until today, when we didn’t go. The days are piping hot, up to 9o degrees and the hot sun burns into your skin, but the nights are now getting down into the 60s, so we wake up slightly chilly. Took walks around the pond, had 2 other friends over Sun. morning & they talked about being in Africa & practiced Swahili. Shared late breakfast/early lunch. They left Sun. night but their car broke down about 45 mins. away from here. It’s incredible what then happened. They called, waited until Al got there & was looking at the battery, then BOOM!! A car wreck happened right next to where they were. Al pulled a car door off to get some people out of one car, and directed traffic. Jean called 911. As Leah said, “Our car broke down so we could be here to help these people.” In any case, they returned here, then Jean, Levin AND AL went back AGAIN to start their car to get it back here that night. The gas station they parked in was closed, & there was a WHOLE LOTTA TRAFFIC going in and out of the lot, in the form of illegal activity. They needed to get the car out of there, and the three of them needed to go retrieve it. As Al said, “3 men will not get attacked. Two could get attacked.” I was so glad when they were all done and home at 3am. Didn’t sleep much that night. Monday we were lucky enough to find a place open to get an alternator replaced. They left about 5pm tonight & are finally home. Leah was worried about her class preparation this week. (Me too! I was going to work on it all day today.) But it was fun to have them return. Zakiah slept one more night on blankets at the end of our bed. It was such a nice time together. Took Zakiah to the Chapin local parade today, which is small town memories. 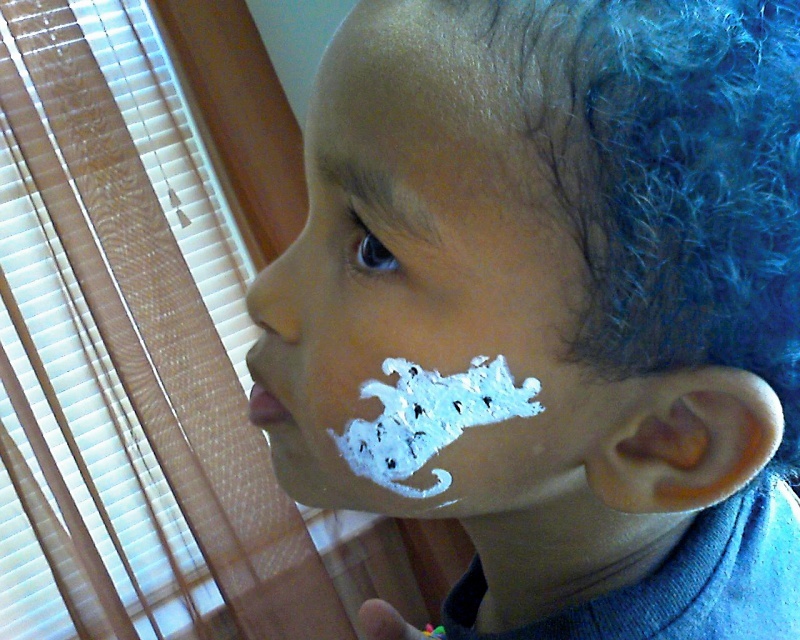 He got his face painte d. All the boy scout troops and local businesses march in a parade and throw candy to the crowd…. Then Zakiah picked out boiled peanuts & went on 2 rides, as well as got a free balloon. a small rocket that launches with air through a cardboard tube, coloring book and crayons, numerous balloons, a “find it” tube with small things in it besides beads, various other little things. I keep an assortment of toys around for visits like these. It is still very hot, to the tune of 100 degrees and heat advisories. But there is a different “mood” entering the air. Kids are bored with swimming, not as excited about going to the pond to fish. Families are gone, taking their last trips to wherever. Summer camps are over. Stores are filled with long-sleeved shirts and Fall clothes. Student furniture is all over Wal-mart on sale. Toads and tree frogs are still singing at night, but not quite as loud. My son and daughter-in-law are here the rest of this week, then all family trips and visiting will be over and I will be in work mode. As of Monday, I will be in my office daily. But last night we had 2 big games of Scrabble, the last one I almost won, with a new game that rotates the board and stores your pieces better. And TODAY, a trip to a chiropractor for my son whose back has been out for a week, and then a drive to CHARLESTON and the ocean. People in Wisconsin don’t get to see that big body of water with a weekend drive. So we are going. Then tomorrow morning, a drive back to our daughter’s in Raleigh, from where our son & wife will get on a plane the next morning to fly home. One more visit w/ Naylah, baby girl born this summer, newest member of our family, and Zakiah, big brother, at our daughter’s & son-in-law’s. That will truly complete the circle for this summer. but to the Land of His Beloved? from Whom all blessings flow! From traveling the past 2 mos., I have many thoughts, but that will have to wait until later. I am excited & ready to greet students and be into all the activity of a Fall semester. I’m just not ready yet to present and teach…. Not really home. This is my hometown & will always feel like home. But I am not home. Still in other people’s spaces. Walked through the Mall here today, used my new Penny’s card. It is always fun to spend money when it doesn’t affect your immediate cash available… Dangerous freedom. There is one Mall in this town. I remember when it was built. My husband and I came home from college & noticed this huge new complex being built, which was to be called a “Mall”. What a concept. What came before Malls? Stores in the downtown area, something which does not really exist any longer. Non-franchise food. Drive-ins, and car hops, ice cream joints next to the park where teenagers hang out. It is always a walk into the past to come back here. I await the arrival of my in-laws to their own home, which is where I currently am, having entered with a key. My son and his wife are here for his 10-yr high school reunion. Will see them soon as well, along with my daughter after she gets off work, and her 2 boys again. At this moment, all is quiet. If I get time alone, I can once again gather my thoughts and feel somewhat together. When I am with other people 24/7, I begin to lose the capacity to feel whole. I am a true introvert. It is very difficult to just get my bearings each day, decide what to do. I have no home to come back to, to reorient myself. Staying at my daughter’s where my cell phone does not get reception, there is no Internet and no tv cable. Disconnected from the world. This blog has become somewhat of a diary, which is probably not a good thing. Not all that interesting to anyone besides myself. I have been home I think maybe 3 weeks since May 24th, and one of those was with a grandson there. Another week with 2 other grandsons there. I will make it to New Albany somehow, for 1 day and at least locate and photograph my great-grandparents’ Agnews graves. Frustrating that I have not had the time to do any more family history research.